The Copenhagen climate conference (COP15) opens its doors in a little under two weeks. 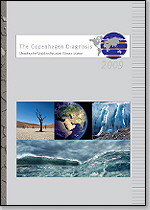 To update participants on the science of climate a new assessment report, The Copenhagen Diagnosis, was released yesterday, and it makes grim reading. Designed to inform “a target readership of policy-makers, stakeholders, the media and the broader public” about the evidence that’s emerged since the 2005 cut-off for the IPCC’s Fourth Report, it is especially strong on the accumulating signs of climate change as it happens. Evidence of melting of the Greenland and Antarctic ice sheets supports a revision of the expected sea level rise by the end of the century: it “may well exceed” a metre. The rapid sea ice loss in the Arctic in recent years highlights the risks of methane releases from permafrost, but the most direct message is that with global carbon emissions surging up to and beyond the highest of the IPCC’s scenarios, and with pretty strict limits on the amount of carbon we can add to the atmosphere and stay under a 2ºC rise, we need to start cutting emissions soon. It’s a simple enough message. The longer we leave it before starting to cut emissions, the steeper the cuts will need to be. And there’s an obvious corollary: steep cuts will be more expensive. Inaction now means more cost in the future. Where does that leave any government promising to “balance the economy and the environment”? Below the fold: the full executive summary. Delay in action risks irreversible damage: Several vulnerable elements in the climate system (e.g. continental ice-sheets, Amazon rainforest, West African monsoon and others) could be pushed towards abrupt or irreversible change if warming continues in a business-as-usual way throughout this century. The risk of transgressing critical thresholds (’tipping points’) increases strongly with ongoing climate change. Thus waiting for higher levels of scientific certainty could mean that some tipping points will be crossed before they are recognized. The turning point must come soon: If global warming is to be limited to a maximum of 2 °C above pre-industrial values, global emissions need to peak between 2015 and 2020 and then decline rapidly. To stabilize climate, a decarbonized global society — with near-zero emissions of CO2 and other long-lived greenhouse gases — needs to be reached well within this century. 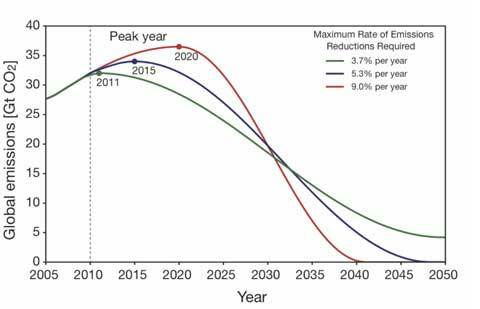 More specifically, the average annual per-capita emissions will have to shrink to well under 1 metric ton CO2 by 2050. 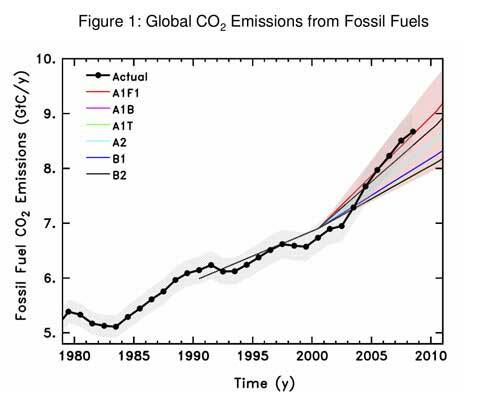 This is 80-95% below the per-capita emissions in developed nations in 2000. This doctor’s diagnosis is well worth reading in full. The sections on tipping points and permafrost are especially interesting, but from my perspective there’s not enough acknowledgement of the risks of methane hydrate release from shallow Arctic sea floors, or the atmospheric impacts of Arctic sea ice loss (see this year’s WWF Arctic report for more). But it’s not the detail of the report that should stiffen the resolve of the negotiators in Copenhagen next month, it’s the clear direction of the signpost: worse than expected on all counts.